HALIFAX - The recovery of overexploited fish populations such as cod has been slower than expected and many depleted stocks may never be able to bounce back, a new study says. The study, to be published Friday in the journal Science, was compiled by researchers who examined 153 fish and invertebrate stocks from around the world. Most fish species are resilient enough to recover within a decade if swift action is taken to reduce pressure on depleted stocks, the researchers say. "But when you don't take action rapidly ... not only does it result in a much longer potential recovery time, but the uncertainty as to whether recovery will happen at all increases exponentially," said Jeff Hutchings, a professor of biology at Dalhousie University and one of the authors of the study. Hutchings said that may explain why cod hasn't bounced back more than 20 years after Ottawa declared a moratorium on the commercial cod fishery, a once thriving Atlantic Canadian industry. "Here we are two decades after enormous depletion of cod stocks ... and people are still wondering about the prospects of recovery," said Hutchings. "Our study really suggests that recovery is quite unlikely now for cod because of our failure to act when we could have." Hutchings said the federal government needs to set a population threshold that would determine when action must be taken to reduce pressure on a fishery. He said legislation is needed to allow for depleted stocks to recover, as they have in the United States. There, when a commercial stock is overfished, fishing ceases immediately and a plan must be put in place within two years to rebuild the stock within a decade, he said. "Canada currently has no such requirements for recovery or rebuilding plans and we also do not have a legislatively required trigger for such action," he said. "I would like to think that this kind of work would provide even more scientific incentive ... to come up with target reference points and rebuilding targets for all of our depleted fisheries." Hutchings said this would not only be beneficial from a biological standpoint, but would also ensure food security and employment in the fishing industry. Frank Stanek, a spokesman for the federal Fisheries Department, said in an email that the government introduced conservation measures after the 1992 moratorium that included gear restrictions and cod by-catch limits. He added that a working group on the cod recovery was set up "to develop a fishery decision-making framework that incorporates the precautionary approach for this stock." 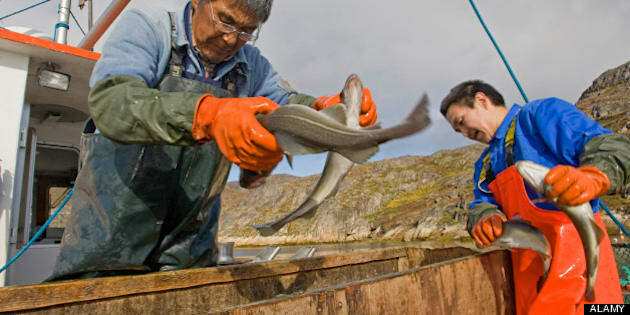 Since the early 1960s, cod populations off the northeast coast of Newfoundland and Labrador have declined by more than 97 per cent and are now at historically low levels, according to the Department of Fisheries and Oceans. The study looked at fish species including herring and yellowtail founder whose populations had declined below their maximum sustainable yield, which is set by the United Nations Convention on the Law of the Sea.